One of the questions ive been asked is how to I put my flash script to grab data from the SQL database and provide updates if the device is on or off etc. Well the awnser is, I dont. Like mentioned before to have your flash talk directly to a sql database you will need additional components which I dont want to install $$$, such as cold fusion or some advanced Flash stuff. Again I want speed and functionality, especially if its only for a few users. So what I did was use a internal web server which is installed with VB 2008, to do all the talking for me, more like a middle man. for example my flash program talks to this web page using the ‘load’ function which sends data using the POST commands (example http://192.168.0.101/finddata.aspx&IN=14) and the code runs and returns the values needed in a specific variable in this case ‘VALUE’. you can also use the LoadVariables command which explain that in this article. So here is a high level of what is being done in the background. All all times the Insteon Server is updating the SQL Server with the status of the devices as they are turned on or off, so we dont need to connect there. Also note that the Local .net, SQL database and insteon server are all on the same box! Prepare: In Flash you will need to create a empty movie clip called ‘fan_master’. Also have images already in your webpage in the location mentioned below. I call it right of the same page you can use your local library if you like. 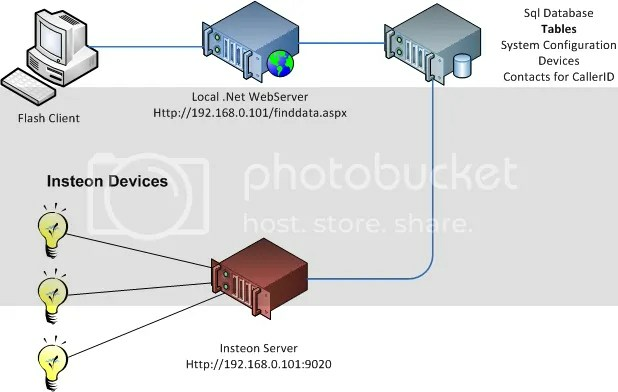 Dim sqlConnection10 As New System.Data.SqlClient.SqlConnection(ConnectionSTring) ' Set your connectionstring accordingly. Cmd10.CommandText = "SELECT * FROM Devices where Marker= '" + Marker + "'"
For example if I pass(showall=1) it would run another function, but that is another article. Below we want to call a web page when a person presses a button, Just like in VB you capture the ‘event’ that is the release event. Yes sure you got a bunch of other features but I still think its a bit overkill… o well I think I just answered my question. For what i’m using now version 2.0 will do fine. Flash:Showing the ‘time’ in flash continuously. 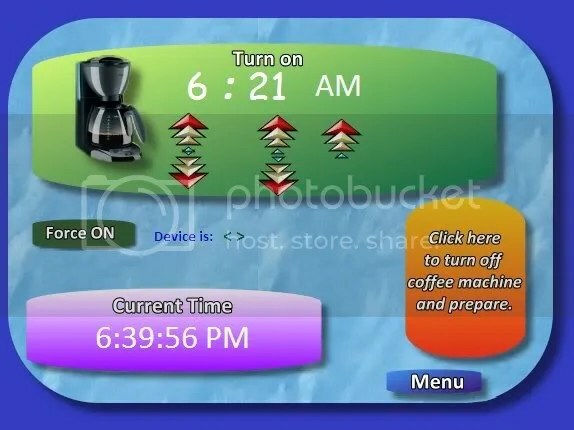 Last week I was working on automating the house’s coffee machine. And a real neat feature I saw around was the ability to display updated content in flash. In bare bones, simple copy and paste, below is the the code I used to update the clock each second. Basically open a scene of one frame and insert the code below on it.
' ------------------------------------ If minutes is less the 10 then add a 0 in front so it looks like 01,02,03 etc.
' ------------------------------------ If seconds is less the 10 then add a 0 in front so it looks like 01,02,03 etc.
' ---------------------------------------- If hours is over 24 then its PM.
' --------------- Update Dynamic variabel to .txtTime on the _root layer. stop();   '---------- Remember to stop the movie if not stopped somewhere else.